Everything you need in a simple package, the new Mirage Compass slides easily across the water. 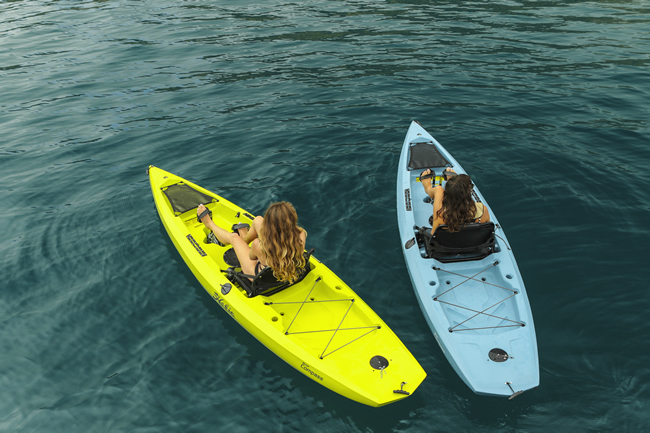 Powered by the revolutionary MirageDrive pedal system with Glide Technology, you'll navigate forward virtually hands-free with this lightweight and easy to transport kayak. It is a true pedal/paddle hybrid complete with an ergonomic, breathable mesh seat. The Compass is confidently stable and pleasantly nimble, ideal for wildlife watching, fishing, camping or leisurely cruising through splendid scenery. Available in Slate Blue, Papaya Orange and Sea Grass colors.